Supply chain practitioners must consider blockchain technology’s potential use cases to establish its true potential. London, 26 October 2016 – Blockchain technology, which transfers the ownership of a cryptocurrency, can be equally extended to transferring title of any other asset. A pallet of goods, a bill of lading, a purchase order, and a certificate of origin are all examples of assets that similarly would apply to blockchain capabilities, and blockchain technology has important possible applications in supply chain management. Nevertheless, banks and vendors lack an industry-wide approach to listen to and capture corporate user needs. 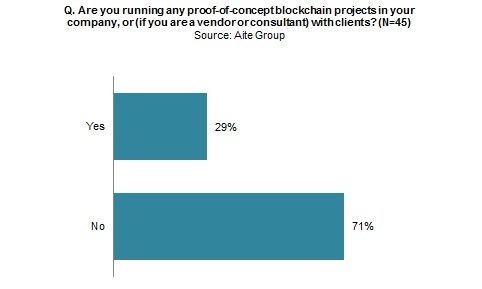 This report verifies how blockchain impacts supply chain management processes and identifies the areas in which SCM professionals would most benefit from blockchain-based applications. It is based on an email survey questionnaire Aite Group sent to 45 selected corporate supply chain experts and service providers in Europe and the U.S. between July and September 2016. This 17-page Impact Report contains six figures and one table. Clients of Aite Group’s Wholesale Banking & Payments service can download this report, the corresponding charts, and the Executive Impact Deck.